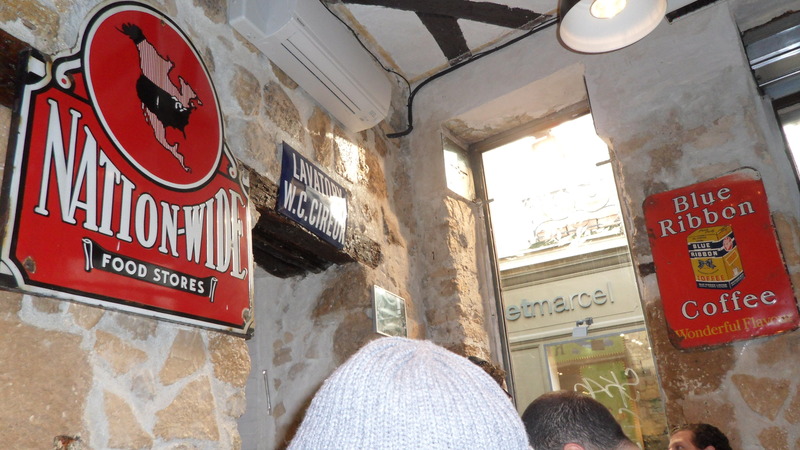 During our family guided walking tour of the Marais, led by my father who was probably either a tour guide or an encyclopedia in his past life, we stopped at Mickey’s Deli for lunch. It was freezing outside and we needed to find a place to sit down after hours of walking and freezing our butts off. 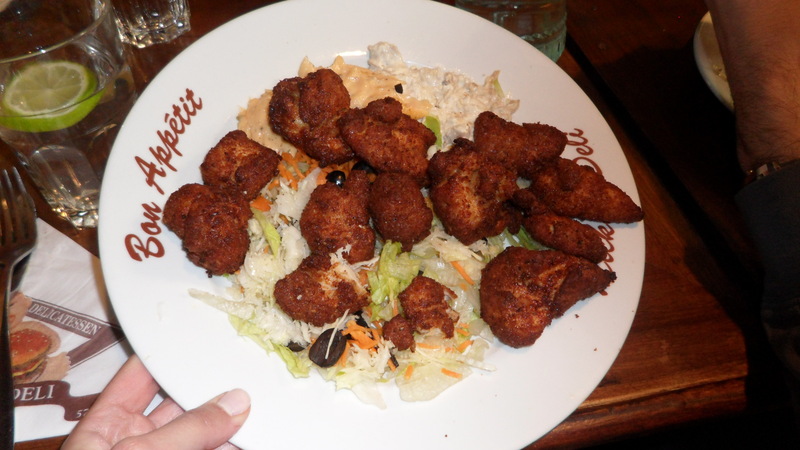 It is one of the only sit down Kosher restaurants in La Marais, as many of the kosher eateries are falafel stands, bakeries, and casual pizzerias. 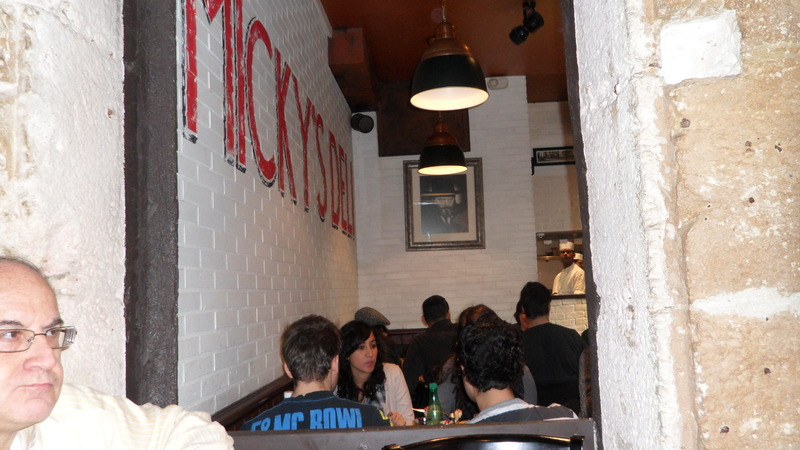 Mickey’s Deli was packed with people and the tables are pushed very closely together. There is a loud and chaotic vibe in the restaurant- waiters running back and forth and bumping into each other, tourist families, babies crying, the strong smell of deli meat. The inside is meant to resemble a New York style deli, with brick walls covered in English slogans and signs and cartoon paintings. The food at Mickey’s is not the kind of food that I would opt to eat on a regular basis, however, it hit the spot for today. Most of the items on the menu are deli and meat based items like hamburgers, chicken thighs, and french fries. 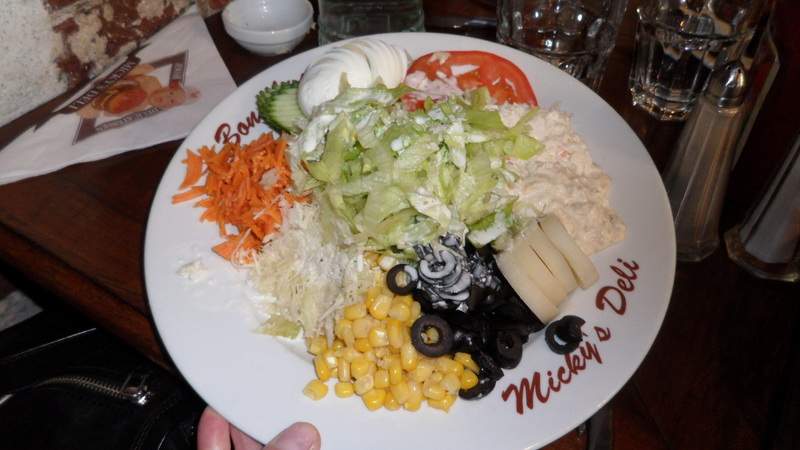 The portions are large American portions- the antithesis of a typical sized dish at a restaurant in Paris. Josh and my dad both ordered a hamburger with fries. The burger came with a sunny side up egg on top, which I don’t believe is a frequented way to serve a hamburger at a NY deli. The French like to put egg in everything and often times, the egg is not part of the dish’s description on the menu. They put egg on/in everything from pizza to potato puff pastries to even hamburgers. Aside from the egg (which Josh removed an put to the side), there was nothing special about the burger, as it was a classic patty on a sesame seed bun with tomato and lettuce. My mom ordered a simple salad with a variety of vegetables and creamy dressing, which she really enjoyed. Of course, her salad came with hard boiled egg! I ordered fried chicken beignets served on a bed of cabbage with an eggplant puree and mayo dipping sauce on the side. The chicken was very crispy on the outside and the meat was moist and juicy. I especially loved the eggplant puree and dipping sauce, a perfect compliment to a pretty heavy (and delicious) dish. There was only one tiny bathroom at Mickey’s and it felt very unsanitary. Further, the lock was broken and went I went to use the facilities, someone walked in on me! They had attempted several times to pry the door open and I resisted from the other side with my hand. It was really bizarre because they wouldn’t relent until finally, they opened the door. I was a bit horrified and shut it right away, after which the pushing ceased. Mickey’s was a good place to grab a quick sit down lunch, but it is not a classy or clean place to eat with a serene environment. 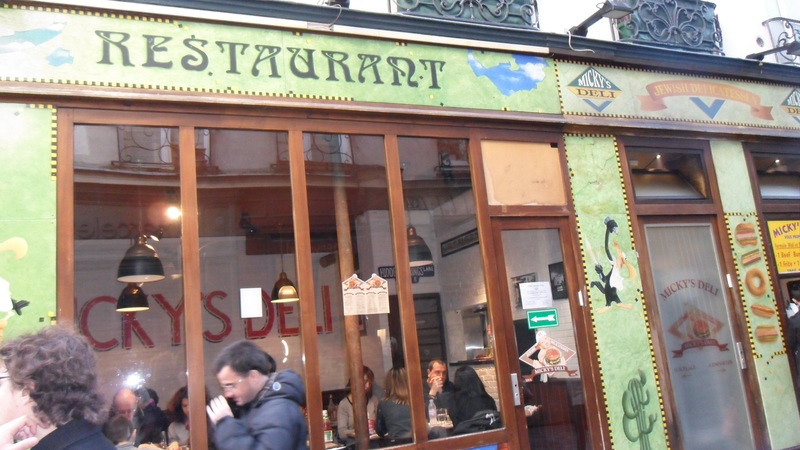 For that kind of restaurant, you have to leave the Marais and head to a different part of town. 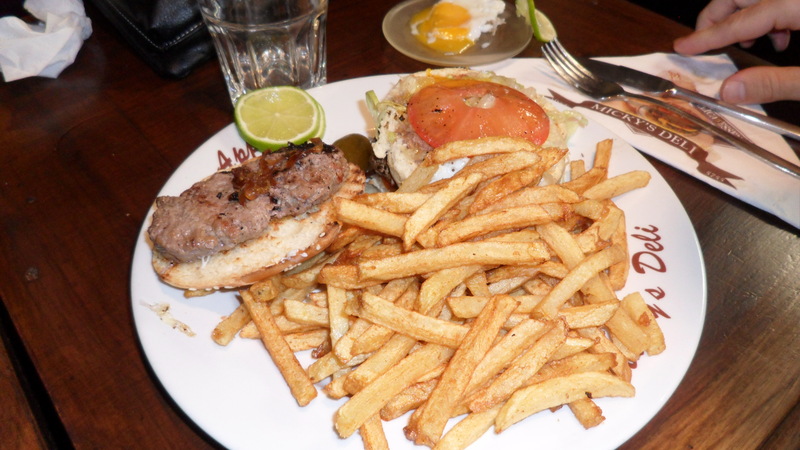 This entry was posted in $$, 2 Stars, American, Arrondissement 4, Uncategorized. Bookmark the permalink.